Writing is the dream career for many of us. If you think you’re able to craft a nifty sentence, spin a good story, and impress a reader, you’ve probably wondered what it might be like to get paid to write. Luckily, writing can be a realistic career these days thanks to the internet and the wider amount of printed media now available to us in the form of blogs, online magazines, and web news sources. Alternatively, if you’ve already made the leap, you may still be trying to figure out how to make a living this way. Yes, you can write and write and write. But where’s the money? 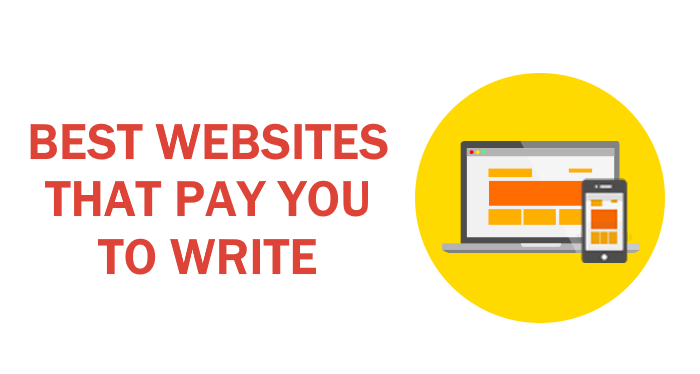 You simply need to find websites that pay you to write. By this, we aren’t talking about freelancing platforms like UPwork or Freelancer where you submit proposals to clients and spend most of your time fishing about for projects. Instead, we’re focusing on established online media platforms which pay writers to create articles for them. Some require you to pitch an article, others want to read the whole piece before they decide whether to buy or not, and some will consider you based on the strength of your portfolio. The important thing is that they all pay real, fair money for writing work that you can be proud of. On these websites, you’ll essentially work as a guest writer. You don’t have a weekly column (although they might help you to find one eventually! ), but you’ll write, sell, and get to be proud of something you’ve written for their website. It cuts out all the time wasting of freelancing job boards and lets you write about things you’re interested in and earn money for it. Do you want to make money based on the strength of your writing skills? Check out these top 10 websites that will pay you to write for them. Great Escape Publishing is all about getting paid to travel, particularly by making a living from writing while you travel. If you’re a travel writer or you move around a lot, you could be the perfect writer for them. Based in Florida, they primarily welcome articles from photographers and writers who have some experience of getting paid to travel or were paid while traveling. If you fit that criterion, your writing just might find a home with them. Great Escape Publishing doesn’t publish straightforward articles about travel; instead, they look for pieces about getting paid to travel and interviews with people who can help their readers live this lifestyle. They ask for 300- to 600-word submissions to be sent, already completed, to their website so that you can skip the pitch. Their payout is very fair, with a rate of $50 to $75 for an article on their website, $100 to $150 for personal stories and interviews, and $150 to $200 for articles with specific income advice. Earth Island Journal is a wildlife and conservation website that publishes a range of articles about innovations in technology and science, climate and energy, animal rights, environmental justice, and films and books about these subjects. The site also welcomes contributions about communities and individuals who are defending the planet. Earth Island Journal operates out of North America, but they welcome stories from all over the world. That said, they expressly mention that their readership is international, so highly localized stories won’t do well with them. If you’re interested in publishing with Earth Island Journal, they ask that you pitch them a story via email describing why it is important and newsworthy. They pay 25 cents per word for a print story, so you’re looking at $750 to $1,000 for an in-depth story that runs between 3,000 and 4,000 words, which makes them one of the best websites to write for by far, so they’re certainly worth your consideration. Although they aren’t looking for overly technical reports, they ask for articles that are suitable for an already environmentally savvy audience, so you don’t need to dumb anything down. Earth Island Journal is a great place to send a pitch if you think you’ve got something to say when it comes to wildlife and conservation efforts. AListApart is a popular webzine about the design, creation, and meaning of web content. They are the perfect place to publish for someone who is interested in technology and knowledgeable about best practices when it comes to online content. They publish in English and Arabic and also have an Italian version, so there are several language options when it comes to writing for them. AListApart asks for submissions from all sorts of web professionals including designers, developers, architects, strategists, and writers. You can send your completed piece to AListApart via Google Docs where the editorial team will review it. AListApart publishes three different types of content: features, articles, and mini-articles. Features range between 1,500 and 2,500 words and are required to meet rigorous editorial criteria. Articles are just 600 to 15,00 words and cover simpler tutorials and posts. Mini-articles are short 500- to 600-word pieces that get their message across quickly. The site pays $200 for a feature, $100 for an article, and $50 for a mini-article, so they’re a great spot to check out if you want to publish an informative article for good pay. Cooking Detective is a website focused on food, health, and kitchen utensils, so it’s the perfect place to consider if you fancy yourself as a bit of a foodie. This US-based website publishes articles in all sorts of areas, so you can stretch your imagination and work with all types of food and nutrition areas to craft an article for them. They publish blog-style articles, interviews, how-to guides, and product reviews, amongst other things, so there are plenty of avenues to take if you’re considering writing for them. They offer spots to both guest writers and paid writers, and ask you to email and them some information about yourself, whether you’d like to work as a guest or paid, and your rate for a 1000-word article. Cooking Detective pays between $120 and $160 for an ultimate guide article, which is a 3,000- to 4,000-word piece that offers in-depth information on a particular type of appliance or food preparation. They also pay $75 for general articles which have a length of more than 2,000 words. They also offer an author bio page with a link to your published articles, so they are another good website to write for if you’re trying to build your portfolio. If you know a little something about managing your money, you should consider publishing an article with MoneyPantry. It’s a personal finance blog that offers advice on how to save and grow your money, and how to make a little extra money through side hustles and practical ways of making money online. They mention that they are looking for freelance writers and anyone who has made or saved money unusually or interestingly. An Iranian-American money blogger runs MoneyPantry and will pay a reasonable rate for articles. Their guidelines ask for materials that are no less than 700 words, with paragraphs of only two or three sentences, and that includes an introduction and a “final words” section. If you’ve got real-world experience, certainly include it. There’s no need to pitch your article here, rather, you can send the full text of your article via email where the site’s owner will review it. MoneyPantry pays between $30 and $150 per post, although it does seem possible that there is some wiggle room in this budget. If MoneyPantry accepts your article, you’ll be paid via PayPal once your post goes live. WondersList is one of those sites that probably won’t make you big bucks but will pay you something for your written work. They are another list article website, although their lists cover nearly any topic you can imagine. They ask for 800-word articles that present the items in descending order (beginning with No. 10 and counting down to the big No. 1). WondersList welcomes content about animals, entertainment, sports, humor, and more, so your ideas can be almost completely unconstrained. They do mention, however, that they don’t desire content about illicit topics like illegal activities, drugs, or weapons. Because you will get a byline in any post you publish with them, WondersList can be useful for your writing portfolio. However, their pay rate is less than exemplary at just $5 per article, which means you’ll have to be working on your words-per-minute writing speed to make a reasonable amount of money with them. When it comes to making money, WondersList probably isn’t the place to start. However, if your aim is just to make some cash while you build up a portfolio to show future clients, or if you’ve already written a list that fits their criteria and you don’t mind letting it go for low pay, they could be a useful publishing spot. Wow! is the common gathering place for female writers, offering their audience information about writing fiction and pursuing writing projects. They also function as a community for women authors and run regular competitions focused on creating short pieces of fiction. This US-based operation is an excellent website to have a look at when you’re thinking about publishing articles for money. Their writer guidelines specify that they welcome general queries from their audience of women writers, so you might not have much luck if you’re a male author. You can pitch an article to Wow! by sending them an email with your story pitch included in the body of the message. They are searching for how-to articles about writing and publishing, as well as interviews with people in the publishing industry. For an item between 1,000 and 3,000 words, they pay $50 to $75, which means it’s not the biggest payer out there. You can, however, net some cash for writing about an area you probably know a little something about already. They pay out on PayPal upon publication, like many of the other sites mentioned here, so make sure you’ve got an account set up. You submit your full list to ListVerse for their approval, so there’s no pitching process at play here. If they like it, they’ll pay you $100 via PayPal. This relatively simple system works well for them and allows you to avoid the time that it takes to pitch an article and have it accepted and reviewed. If you’ve got a list article that fits the guidelines and seems like it could have a home on ListVerse, you’ve got nothing to lose by sending it in. The Layout is a popular blog about WordPress design, so it’s perfect for technology fans and anyone with a background in web design. The blog is a part of Flywheel, a web-hosting service with which you may already be familiar. Based in Omaha, Nebraska, the site mainly covers topics like how to keep on top of new WordPress design methods, maximizing your site’s impact, and keeping it safe from hacking. Of course, there are plenty of other angles you can work from too. If you’re familiar with WordPress or you consider yourself capable of doing good research, you can pitch an idea for The Layout’s consideration. They ask you to give information about what you like to write about and any links to content you’ve published before, but that’s not all. There’s also a section of desired articles which you can choose to write, if they like your style. The Layout pay between $50 and $150 per article and offer you an author page with a short bio, a photograph, and all of your writing for their website too, so you can easily and helpfully showcase your work to future clients. Cracked is one of the most well-known websites when it comes to fair pay for good writing, so it’s a great place to start. If you’ve got a good sense of humor and can pull off a funny tone in your writing, Cracked could be the website for you. Based out of California and New York in the US, Cracked specializes in hilarious list-style articles about whatever is weird, funny, and entertaining. Their big categories include Movies and TV, Video Games, Science, Tech, History, and Weird World, so there are plenty of options for aspiring writers when it comes to subject matter. To write for Cracked, you first need to submit a pitch. By registering on the website, you’ll gain access to the private message board where you can read plenty of advice about how to pitch a great idea, and eventually submit your own. If Cracked likes your idea and asks you to write for them, you’ll receive $150 per article for the first four submissions. Once you’ve sold them four, you’ll start receiving $250 every time. On top of this, you receive a $100 bonus if your article is one of the 10 highest trafficked for the month, so you’re incentivized to create something interesting. Freelance writing doesn’t have to be an endless cycle of searching for jobs, putting your best foot forward, and being beaten to the punch by writers who are willing to work long hours for tiny amounts of money. If you find the right websites, you can make real money for writing about topics that interest you. These websites are a brilliant place to start, but there are plenty of other platforms with niches that can suit your interests and style. You can use them to hone your writing skills and make significant money from just about anywhere in the world. These websites are all great if you’re looking to make some money from writing. Whether you’re just starting out as a writer or you’ve gotten stuck in a rut when it comes to selling your work, these could be the sites that will help you out. If they like your ideas or your approach, you’ll gain a paid writing job that you can put on your portfolio and truly be proud of. At the same time, they allow you to make contacts and offer the possibility of repeat work. So what are you waiting for? Check these websites out, pitch a story, and get ready to make some money!